While the off-field dramas at the Wests Tigers have had an effect on the team, winger David Nofoaluma is confident the good times are ahead for the embattled club. Despite narrowly going down 16-12 to St George Illawarra at the weekend, Ivan Cleary's men showed vast improvement after coming off their first bye week looking refreshed. 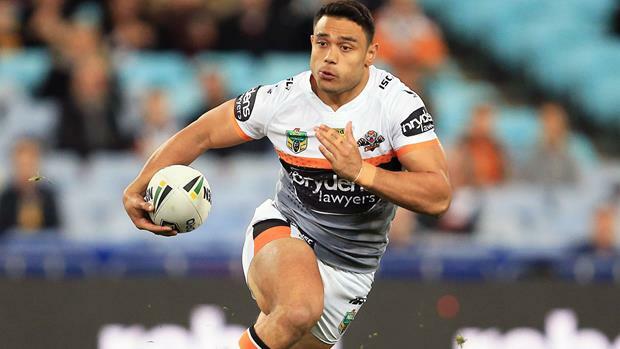 Nofoaluma has been one of the club's best this season in attack averaging 171 metres per game and had made the fourth most tackle breaks in the Telstra Premiership, but admitted there were areas in defence he needed to improve. With the immediate release of Mitchell Moses to Parramatta and addition of Tuimoala Lolohea from the Warriors early last week, the 23-year-old is hopeful the side has seen the worst of their season off the park with an improved showing against the Red V an early indicator. "Obviously with all the drama going on in the media and the departure of Mitch, as much as a team we want to forget about it, it's hard not to," Nofoaluma told NRL.com. "Hopefully in a few weeks it all dies down and we can just focus on our job playing footy as a team. "For me I hope it is the end [of all the drama]." The long-term key for the club is to figure out who will replace NSW fullback James Tedesco beyond this season and after spending time in the No.1 jersey throughout his junior career, Nofoaluma wouldn't feel out of place. Ironically, Nofoaluma played fullback for Western Suburbs with Tedesco on the wing back in SG Ball and at NSW under 18s level, however the Samoan representative admitted he would need time to adjust if he was to take on the role at the top level in the future. "I'd be happy to move into fullback if Ivan needed me but I need a few games consistently at the back to see how I would go," he said. "There are definitely a few things I would need to adapt to if that were to happen." With all the talk surrounding big name players and their futures at the club creating the headlines earlier in the year, Nofoaluma was not going to be influenced by what his teammates were doing and re-signed on a new four-year deal back in April. "I always said from the get-go that my first preference was the Wests Tigers so it didn't matter what the other guys were doing," he said. "I was happy the club always said they were keen to keep me and that's how I still feel so nothing has changed from my end." Nofoaluma remained confident 2017 was still an opportunity for the current squad to finish the season well, however he couldn't help but be excited for what's to come after key recruits Josh Reynolds, Chris McQueen, Ben Matulino and Russell Packer will all link with the club in 2018. "The players he has signed is exciting and myself, they're not just your average signings but big names who are good players," Nofoaluma said. "I don't think that's the end either, hopefully there is more to come and add to the roster. "I'm excited and that's what keeps me passionate about the club." For the frustrated Wests Tigers fan base, Nofoaluma had one simple message to the faithful after a tough start to the Telstra Premiership. "I know we've got loyal supporters and there are tough times at the moment," he said. "But we've got a situation where we have to play our hearts out until the end of the year and we know that. "I hope they can stick solid because I'm pretty confident in the future and what Ivan is doing is going to make it a bright one." Wests Tigers return to Campbelltown Stadium to take on the Sydney Roosters on Sunday where former coach Jason Taylor will take on his former club for the first time as the Tricolours' assistant coach.